All things must pass. 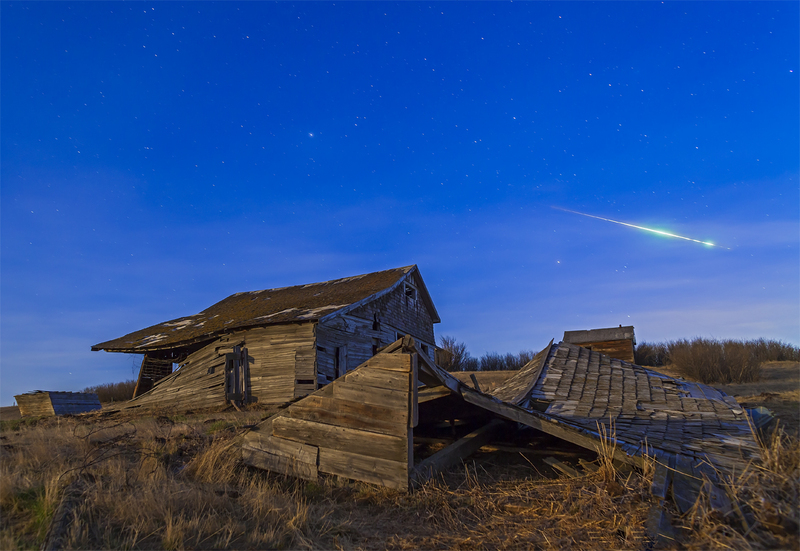 A bit of billion-year-old comet dust disintegrates above a decaying pioneer farm. This was a lucky shot to be sure. 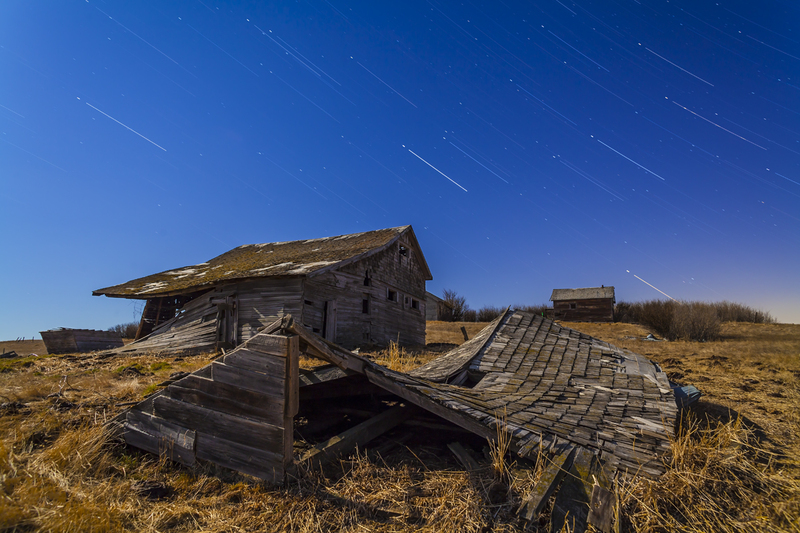 Last night I returned to my favourite farmstead site to shoot a time-lapse sequence of the stars turning over the moonlit rustic buildings. I started shooting some test frames to get the settings right — the camera was on a motorized dolly to move it along a track for the next three hours, so you want to make sure you have all the settings right. I opened the shutter to start a test series, and whoosh! A bright meteor appeared. Right on time and in frame. That doesn’t happen very often! 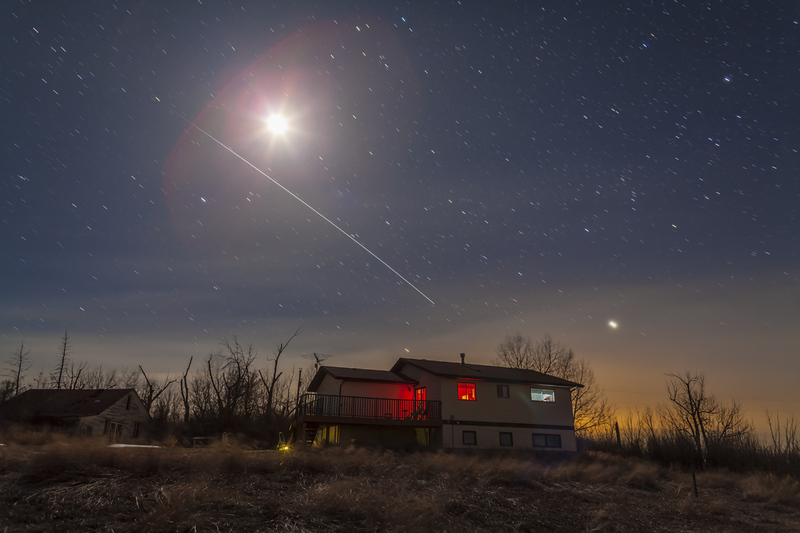 However, shooting hundreds of shots for a time-lapse sequence, now a common practice among astrophotographers, does boost your chances of picking up a bright meteor on one of the frames. But having it appear nicely framed is often too much to ask. I was lucky. But … I was out with a camera aimed at the sky, and for getting good shots that’s the first requirement! The works of man crumble and return to the Earth under the timeless turning of the stars. OK, a bit of purply prose I suppose, but I think the photo turned out rather neat. This is a favourite spot of mine, at a decaying old farmyard down the road from where I live. It’s one of many such homesteads in the area, built by the CPR railway on land they were granted as part of their enticement to build “the National Dream” rail line across Canada in the 1880s. The CPR then built houses for the pioneer settlers who came by rail to be dropped off across the Prairies, often with little more in hand than a shovel and a sack of potatoes to get them going. Eventually, the railway would make money shipping the pioneers’ wheat and cattle out. This old homestead was once part of a community in the area called Ouletteville, a town I assume settled by French Canadians or immigrants from France, but long since gone except for its cemetery up the road. Now, as the house and farm buildings crumble back to dust, they make great subjects for a little low-effort nightscape shooting, especially when trying out new techniques and gear. I don’t have to invest a lot of time travelling, yet the place is photogenic enough to yield some nice shots. This night I was testing some new panorama shooting techniques, using a fish-eye lens to shoot an all-encompassing 360° view. But this shot was one of several I took at the end of the night, using a more conventional 24mm lens. It’s a stack of 4 exposures: one short 50-second shot at ISO 800 for the initial stars, and then three 10-minute shots at a ISO 100 for the long star trails. I shot this Monday evening, April 22, on the first decent night in nearly three weeks in what has been an awful spring. At least most of the snow has gone. The waxing gibbous Moon provided the off-camera illumination. Commander Chris Hadfield and his crew fly over my house and below the Moon on a spring night in Canada. It’s been a couple of months since we in Canada have had a chance to sight the Space Station in our evening sky with our Canadian astronaut on board. When I last had a chance in February, Chris was a crew member. Now he’s the commander of the Station, the first Canadian to hold the position. My shot, taken tonight on the second of two passes this evening, has the Space Station coming up out of the west and rising to meet the Moon. It passed under the Moon and then faded out as it entered Earth’s shadow and nighttime, one of 16 nights they experienced this and every day in orbit around the Earth. Chris is in orbit with the Expedition 35 crew until mid-May. 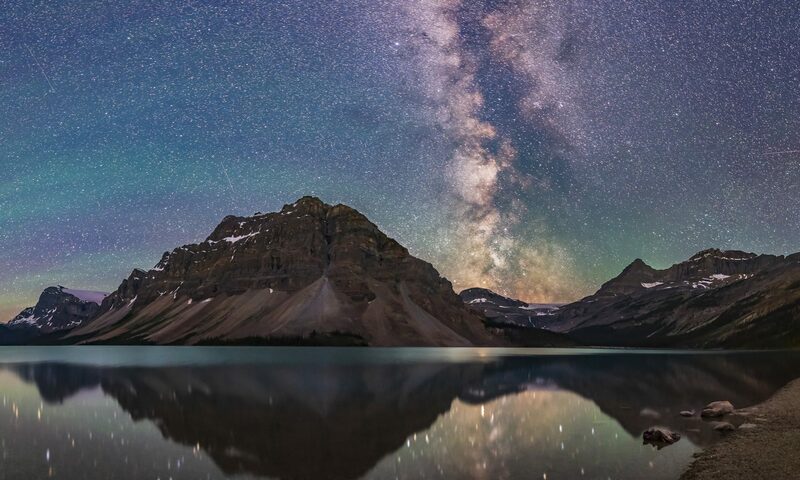 So this may be our best and last chance to see our astronaut flying through Canadian skies. Say goodbye to the winter sky, now sinking fast into the sunset. The departure of Orion and company is an annual sign of spring. 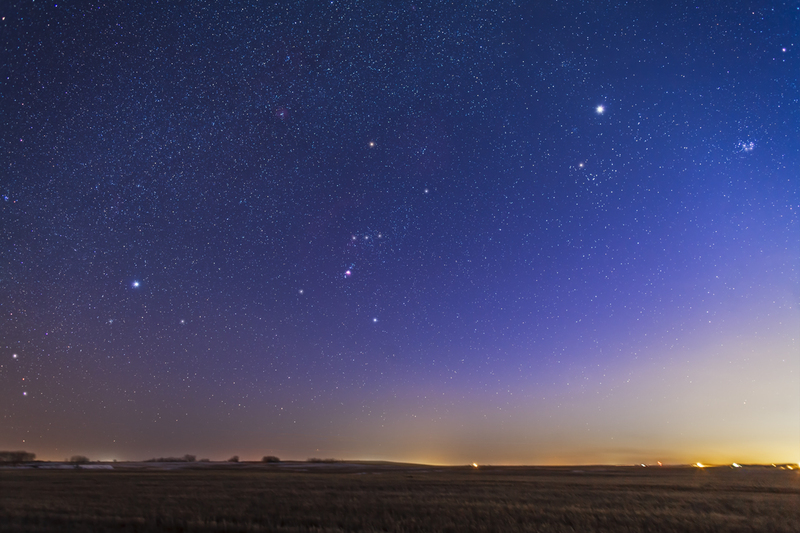 Look west on a clear night in the next couple of weeks and you’ll see this scene, as Orion sinks into the sunset, surrounded by Taurus to the right of him, and Canis Major to the left of him. Taurus is his foe, Canis Major his friend. Having so many bright stars in the April evening twilight makes for a beautiful scene in the deepening blue. But I suspect most of us are happy to see all signs of winter gone for a long time! I shot this Monday night, April 1, on a very clear night. Orion’s Belt is just left of centre. The trio of Belt stars points left and down to Sirius, the Dog Star, and points right and up to Aldebaran, the Bull’s Eye. Above Aldebaran is brilliant Jupiter. Just at the right edge of the frame are the Seven Sisters, the Pleiades. Say goodbye to these stars of winter. We won’t see them again until late summer in the pre-dawn sky. 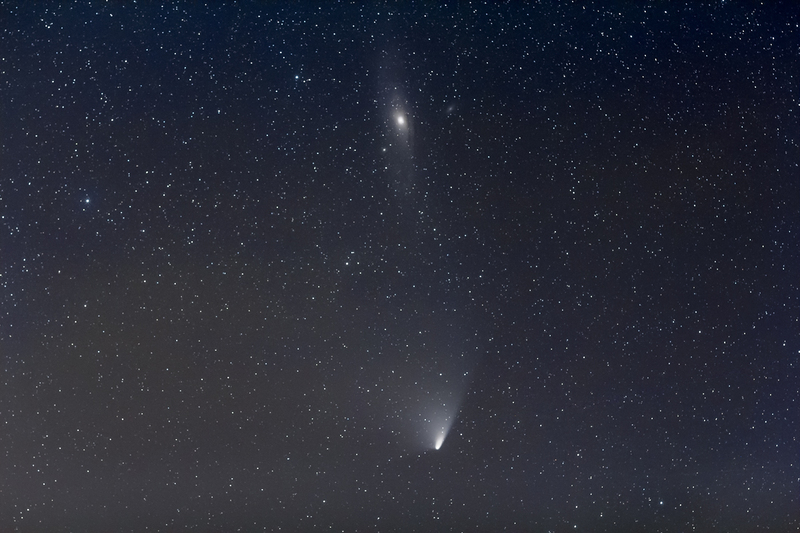 Tonight, April 1, we enjoyed the rare conjunction of a comet with a galaxy. This is Comet PANSTARRS below the Andromeda Galaxy, a.k.a. M31. The two objects were less than a binocular field apart – 4 degrees – on the sky. But in real space they were separated by millions of light years. The comet was 192 million kilometres from Earth tonight and receding. But that’s a stone’s throw compared to the 2.5 million light year distance of the Andromeda Galaxy. Light was taking a mere 10 minutes to get to us from the comet, but the light from Andromeda was 2.5 million years old. And yet, the two objects looked similar in brightness and shape to the binocular-aided eye. I caught the two just above the horizon as they were dipping into haze and trees. The circumstances didn’t make for a technically great photo but with PANSTARRS we’ve all had to shoot despite the conditions and hope for the best. With worsening weather prospects for the next week I suspect this will be my last look at PANSTARRS for a while.